In the global business landscape, increasingly defined by trends such as the sharing economy and the maker movement, companies the world over are facing pressure from consumers, employees and governments to create and deliver first-rate, affordable and sustainable products and services using less energy, less capital and less time. This has led to the development of a new model for business success: Frugal Innovation or the ability to do more and better with less. In this seminal book on a revolutionary worldwide phenomenon, innovation experts Navi Radjou and Jaideep Prabhu chronicle the rise of a frugal economy in the US, Europe and Japan and show how the world's top companies across sectors American Express, Ford, GE, IBM, Levi Strauss, Marks and Spencer, Novartis, Pearson, PepsiCo, Renault Nissan, Siemens and Unilever are achieving great success by embedding frugality into their business models and corporate culture. By doing business faster, better and cheaper, these frugal pioneers have demonstrated how to tap into a trillion dollar global market for sustainable products while realizing huge cost savings. 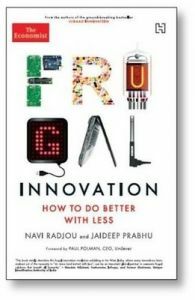 Featuring over 50 case studies and identifying, for the first time, the principles, perspectives and techniques behind frugal innovation, this inspiring and significant book is Corporate India's guide to reclaiming global leadership in frugal innovation by generating greater economic and social value while minimizing the use of resources. Navi Radjou is an innovation and leadership advisor based in Silicon Valley. A fellow at judge Business School, University of Cambridge, he won the 2013 Thinkers 50 Innovation Award and spoke at TED global 2014. Previously, he served as Vice President at Forrester Research in Boston and San Franciso. Over 18 years, he has consulted for leading global firms including BAE systems, BP, Cisco, E&Y, Fujitsu, GM, Hitachi, IBM, Microosoft, P&G, Rolls-Royce, SAP, TCS and Wipro. Jaideep Prabhu is Jawaharlal Nehru Professor of Indian Business and Director of the centre for india and Global Business at Cambridge judge business School. His research and consulting expertise straddles marketing, innovation, strategy and international business. He has consulted for or taught executives from Barclays, Bertelsmann, BP, BT, GE, IBM, ING Bank, the NHS, Nokia, Philips, Shell, Siemens, Vodafone and Xerox, among others.